St. Patrick’s Day on Saturday, March 17, is the perfect day to visit Wright State University, whose school colors just happen to be green and gold. Raider Open House, held from 9 a.m. to 12:30 p.m., begins in the Student Union. Informational sessions about academic programs, financial aid, campus housing, transferring to Wright State, student life, the University Honors Program and more will be offered during the annual event. Breakout sessions will provide in-depth information about academic colleges and departments. Some of these may include academic building tours, project demonstrations or other interactive activities. Students can even talk one-on-one with faculty members about their academic goals and interests. Plus, attendees can explore campus and housing through the eyes of their tour guide, a current Wright State student. Parents and students can learn about Wright State’s new tuition guarantee program that will enable students and families to more confidently plan their finances and provide an incentive for graduating on time. It locks in the same annual cost of tuition, housing and dining over a four-year college career for newly admitted, degree-seeking undergraduate students who are Ohio residents. Sessions and tours will be offered at various times during the open house to allow people to personalize their experience and learn more about the topics that interest them most. Attendees won’t want to miss the Resource Fair, where they can enjoy one-on-one conversations with faculty, staff and students from academic colleges and student services offices at their leisure. 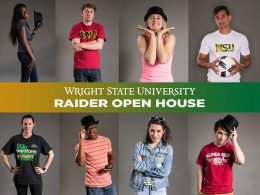 WHEN: Saturday, March 17, 9 a.m. to 12:30 p.m.
For more information and to register, visit wright.edu/admissions/raideropenhouse or call the Office of Admissions at 937-775-5700. Named for the Wright brothers, aviation pioneers who taught the world to fly, Wright State offers students an exceptional education that helps them discover their own potential.